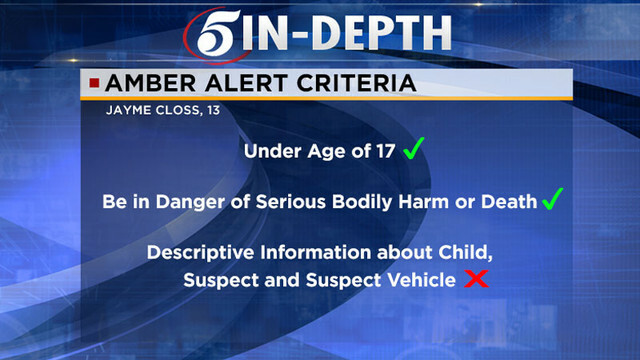 An Amber Alert has now been issued for a missing 13-year-old authorities say was taken from a residence in Barron County where her parents were found dead early this morning. Jayme Closs is described as being 5-foot and 100 pounds. There are no suspects or vehicle information at this time. And authorities do not have a clothing description. Anyone with any information is asked to call 911 or the Barron County Sheriff's Department at 1-855-744-3879. According to the sheriff's office, deputies received a 911 call Monday at about 12:58 a.m. asking for help to be sent to a residence along Highway 8. Upon arrival, authorities found two adults who were pronounced dead at the scene. Authorities learned Closs was missing from the residence. They said they are concerned for her wellbeing. The sheriff also confirms the two deceased adults are Closs's parents, though names and ages have not been released. There had been no previous calls to the house where the bodies were found, according to the sheriff. "It's nothing I've ever seen in my 20 years in law enforcement," Barron County Sheriff Chris Fitzgerald told 5 EYEWITNESS NEWS. "Something took place I just don't what and that's part of the problem and some of the frustration we're having. We have a 13-year-old girl vanished and we need to get a hold of her to make sure she's ok."